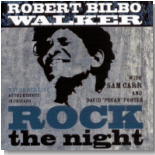 It was a hot night of blues just about two years ago when the eclectic and eccentric Robert "Bilbo" Walker ventured into a Chicago club called the Hideout. The result is a wild ride of a live album, this month's Pick Hit. Maurice John Vaughn, an excellent but vastly underrated guitarist from the Chicago area, has his first new release in quite a few years. It's our Surprise feature this month. Our Blues Bytes main soul man takes a look back at a couple of re-issues of classic Joe Tex material in our Flashback section. This month's What's New section features new releases from Odetta, Arthur Williams, Johnny Jones, Delbert McClinton, Johnny Nicholas, Popa Chubby, Texas Johnny Brown, Janiva Magness and, of course, a couple of holiday-flavored CDs, one from none other than B.B. King.